gbCodeLib is a full-featured, multi-language source code librarian. It has a powerful, built-in source code editor and revision control manager. gbCodeLib has an easy-to-use interface yet provides one of the largest feature sets of any code librarian available today. Over 1000 sample source code snippets, including language mini-tutorials, are included in the distribution. gbCodeLib and its snippets can be updated online. gbCodeLib is free for non-commercial use. This includes personal and educational use. Also, just released is gbXML, a companion program to gbCodeLib. 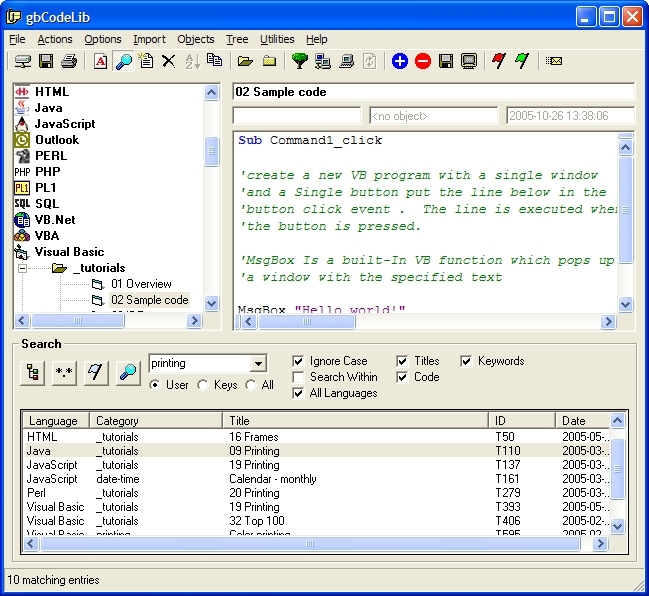 gbXML provides a graphical interface for creating language definition files, which are used by gbCodeLib to define how a language is displayed in its source code editor. There's also a simpler version of gbCodeLib, called gbFlashLib, which can simply be copied to a flash drive and run in place. It's a great way to be able to work with your snippets when you're away from your own PC. A registration fee of $30 per user is required for use of gbCodeLib in commercial or governmental environments. Group purchase rates are available. Paypal and credit cards (Visa/Mastercard/AMEX/Discover) are accepted.